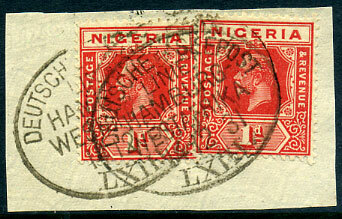 dated 14.12.31 on 2 x KGV 1d piece. XXI (without stop) 5.8.08 on KE7 1d (SG.100), vertical crease. in purple dated 22 OKT. 1933 on KGV ½d, 2 x 4d piece showing portion Plymouth, Devon arrival. 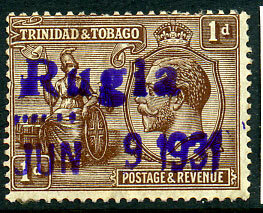 (Rego unlisted, smaller top to "R") in purple dated JUN 9 1931 on KGV 1d (SG.219). Newly discovered.